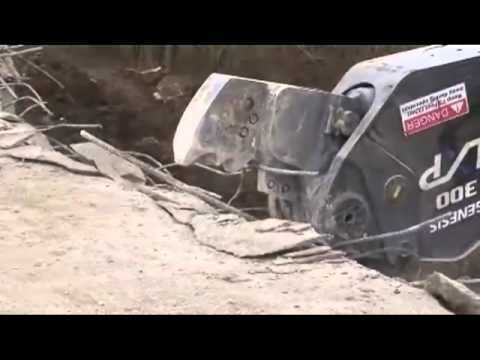 Watch the Genesis LXP with Concrete Cracker Jaws demolish a bridge. Genesis Attachments designed the Genesis LXP® with Concrete Cracker Jaw for concrete recycling, C&D processing, demolition and rebar removal. Featuring a patented pivot system that provides a power curve to match the application, the LXP's jaw tips concentrate force to more thoroughly crush heavy concrete. Designed to fit 20,000 lb. to 150,000 lb. excavators, the Genesis Logix Processor's industry-leading quick-change jaw design provides powerful multiprocessor capabilities. Attachments include pulverizer, concrete cracker and shear jaws that can be changed out in 15 minutes to meet any jobsite need. For additional information, call us at 1-888-SHEAR-IT.